How well do you know Fanny Blankers-Koen? Due to her feat and achievements as a female athlete, she was pivotal in eradicating the belief that women who were older or married with kids couldn’t excel in sports of any kind. Keep reading to learn more inspiring details about the champ. On the 26th of April 1918, Fanny Blankers-Koen was born in Lage Vuursche, Netherlands, to Arnold and Helen Koen. She grew up with five siblings, who were all male. While she was a kid, Fanny had natural talents in various types of sports including; running, swimming, fencing, tennis, gymnastics and ice skating. Though she was good in all these sporting activities, she had problems deciding which one to focus on. The answer later came when the coach of a swimming team advised her to focus on running especially with her height of 5 feet 9 inches (175m). It was suggested that since the Netherlands already had lots of top professional athletes, it would be of greater value for her to concentrate on a sport that wasn’t already dominated like the women’s athletics for instance. Fanny took the coach’s advice and sought to grow and improve in running. As a result of this, she made her very first appearance competitively in 1935, when she was 17 years old. Though she failed to make a good impression, she kept on trying until her third competition when she ran 800m to set a national record. For the Olympics, she easily made the Dutch team as a sprinter instead of a middle distance racer. This was solely due to the fact that long-distance races (800 m) for women racers at the Olympics were scrapped in 1928 because it was deemed to be too physically challenging for women. In 1936, Jan Blankers, who participated in the 1928 Olympics as a triple-jumper, motivated Fanny to participate in the 1936 Olympics trials. At this time, Fanny Blankers-Koen was just eighteen years of age when she got chosen to compete in the 4 × 100 m relays as well as the high jump category. On the date of the 1936 Olympics that held in Berlin, the 4 × 100 m relay, as well as the high jump, was done on the same day. In the relay, she and her team earned fifth place which was the same position she came out in for the high jump category. Seeing that she and her team had a good outing at the Olympics that year, she was encouraged to come back in four years and do much better. Two years later, in 1938, Fanny Blankers-Koen would clinch her very first world record title in the 100-yard race with a record time of 11.0 seconds. She then won bronze medals in the 100 m and 200 m dash held during the European Championship in Vienna. At this game, many felt she would no doubt outperform other contenders in the 1940 Olympics which was to be held in Helsinki. Unfortunately, the 1940 Olympic games were officially canceled as a result of the World War II that broke out that year after the Netherlands was invaded. Before the war, she became engaged to and subsequently married her coach, Jan Blankers, who was fifteen years older than her. Interestingly, Jan Blankers used to be one of those who held the opinion that women shouldn’t be involved in sporting activities, but after falling in love with her, as well as seeing her potential first hand, his thought pattern changed. As a couple, they welcomed their first child and son, Jan Junior, in 1942. After the birth of her son, a lot of people including the Dutch media assumed that her career would be over because there weren’t many women who continued a professional sporting career after childbirth. In addition, given the fact that she was over 30 years of age at the time, she was opined to have been too old to compete in further competitions. To the surprise of many, Fanny Blankers-Koen and her husband began training just a few weeks after she gave birth. She then went on to win 80 m hurdle at the 1946 European Championships. 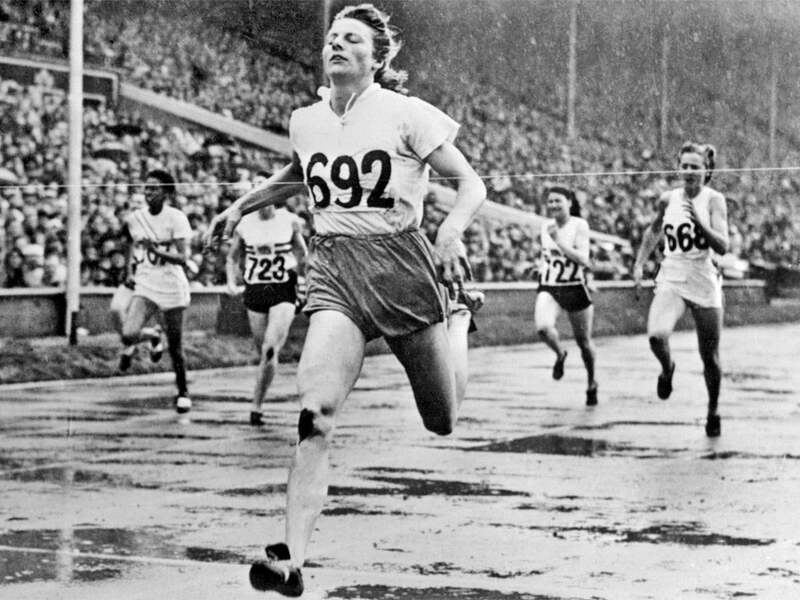 On the 7th of August 1955, she ended her career as an active athlete with a total of 58 Dutch titles and 12 world records. After retiring from active competition, Fanny Blankers-Koen traveled to different countries to promote athletics competition for women. She was also named the leader of the Dutch athletics team, from the 1958 European Championships to the 1968 Summer Olympics. She died in Hoofddorp on the 25th of January 2004, at 85 years of age. She was nicknamed the “Flying Housewife” as well as “A Queen with Men’s Legs” due to her impressive career and story.